My thoughts were all over the place with this book, at least until the end. A few chapters before the ending, it was like switch went off in my head, and all of the sudden I was in love with a book. I had expected something different from what I got, and yet I have a feeling that's what made it better. The author had it right: why try to write a replica of Sherlock, when it's an impossible feat? And so instead, he crafted a novel that parallels the detective theme, but at the same time adds in so many other personalities and themes that has the story appealing to Sherlock fans without making it seem less. 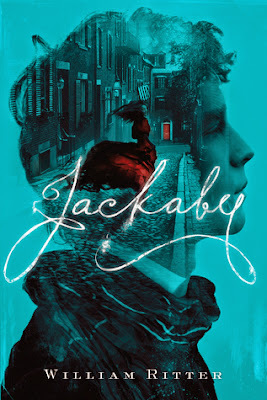 Sure, Jackaby was barely like Sherlock, the romance between Abigail and Charlie was nonexistent, and the supernatural aspect bothered me a bit, but the novel brought everything together so beautifully at the finale, that it was impossible not to get sucked in. As I first started reading this book, I had already imagined, after reading the synopsis, that 'Jackaby' would basically be a Sherlock Holmes look-a-like, with Abigail being the Watson of the story, more or less. Indeed, the first chapter continued along the same lines, and I was secure in the knowledge that I was getting exactly what I wanted: basically, a book version of the TV series, 'Elementary'. The story went on though, and I realized that no, this was not to be the same thing. After getting to know Jackaby a little better, I was sorely disappointed. Besides his sleuthing skills - which honestly, were not up to par with Sherlock's - he wasn't very much like Holmes. For one thing, he had the sight, which allowed him to see creatures such as trolls, ghosts, werewolves, and banshees. And believe it or not, he grinned while in a crime scene; I was offended, honestly. As the novel progressed, however, Jackaby grew on me. I understood him and his behaviors more, and it's pretty safe to say he holds a dear place in my heart, kind of like the way Sherlock does. If I was asked who is weirder, Jackaby or Holmes, well, I think Jackaby is a safe bet. After all, Holmes does stick to logic. Now the romance, that was sort of a disgrace to romances everywhere. Not because it was particularly terrible, or even because it barely existed, bu because it was young love. And by that, I am referring to the type of romance where a young lady is introduced to a young man, they make eye contact a few times, exchange a few words, and fancy themselves in love. It wasn't dreadful by any means, but it wasn't enjoyable either. I could have lived without the romance, but it plays a large role in the end of the story, so it makes sense that it was there. I didn't really appreciate the romance until the last chapter or so, and now that I do, I'm actually excited about it, if not for the reason you'd expect. From the very beginning, no matter how many odds were stacked against me, I had been rooting for Jackaby and Abigail to end up together. I don't know why everyone feels like Sherlock must remain single, but I'm always up for setting him up with someone, and in this novel, Abigail was the lucky catch. Anyone with eyes can see that they're perfect together, and yet Abigail goes after the first young guy in America she makes eye contact with. Lucky for me, I feel like Jackaby and Abigail could develop into something in the next novel, but since there may or may not be another installment, my mind is free to imagine - for now anyways - a relationship blossoming between the two. The ending was expertly done: I love how it sets us up for another book, while at the same time allowing the book to be a stand-alone, and of course, I love the fact that the ending lets readers jump on whichever ship they want! I really do hope there ends up being another novel. The aspect of the mystery that had me doubting the novel from the very beginning was the faerie-like creatures. Sherlock Holmes is a man associated with evidence and reasoning, and to have a man that reminds you of the legend chasing after faeries...it's a bit disconcerting. Like I mentioned before though, I got used to it pretty quickly, and it served to make the two men distinct, which is definitely a good thing. Once I stopped comparing Sherlock and Jackaby, I started loving the plot. There were so many myths intertwined, and the creature the murderer turned out to be was a wonderful surprise (well, as nice a surprise as a murderer can be). The best part of the mystery was probably that while I could guess who the villain was, I never figured out I was right until the author wanted me to. It's often boring when you are able to figure out who did what from the very beginning of the story, so revealing the mystery at the end, and keeping the reader's in suspense, was a great move. Overall, Jackaby is a story that takes the Sherlock series, morphs it into something different, and makes something that is so similar yet so different that it wouldn't be right to compare the two. Fans of Holmes will enjoy reading the novel, as it is reminiscent of the admired detective, but still manages to keep the plot original. I have almost nothing but good things to say about this book, and you'll probably find me gushing about it to whoever comes closest to me. Source: Received a copy from Algonquin Books for review.